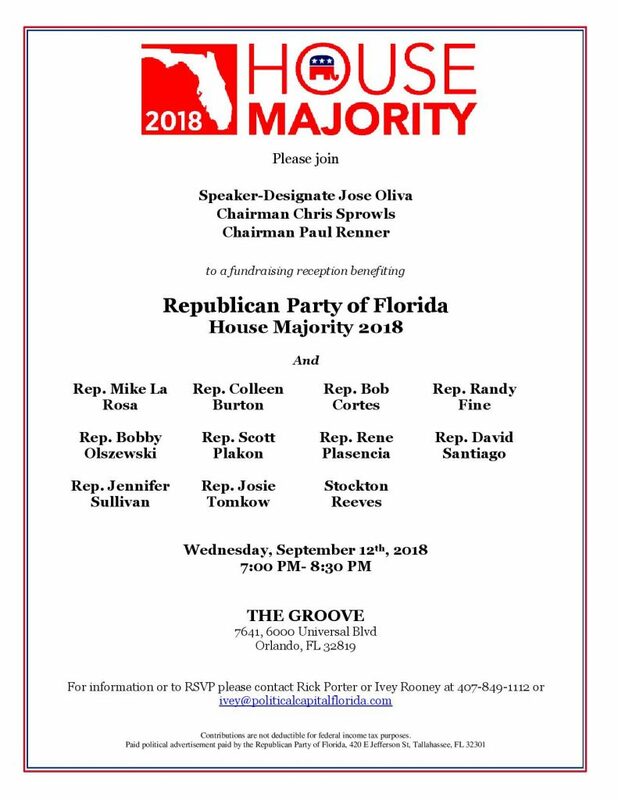 Incoming House Speaker Jose Oliva and the two Republican lawmakers set to succeed him in that post will be in Orlando next week for a fundraiser benefitting the re-election campaigns of their Central Florida colleagues. Oliva, Palm Harbor Rep. Chris Sprowls and Palm Coast Rep. Paul Renner will headline the Sept. 12 fundraising reception at The Groove, 6000 Universal Blvd. The event starts at 7 p.m. The fundraiser will benefit 10 incumbent Republicans representing Brevard, Lake, Orange, Osceola, Polk, Seminole and Volusia counties in the state House: Mike La Rosa, Colleen Burton, Bob Cortes, Randy Fine, Bobby Olszewski, Scott Plakon, Rene Plasencia, David Santiago, Jennifer Sullivan and Josie Tomkow. Also on the invitation is Stockton Reeves, the Republican nominee in House District 47, which is open this year due to current Republican Rep. Mike Miller opting to challenge U.S. Rep. Stephanie Murphy in Florida’s 7th Congressional District. Reeves defeated Mikaela Nix by 10 points in the Republican primary for the seat last week. He now moves on to a general election showdown against well-funded Democratic nominee Anna Eskamani. Most of the incumbents on the invite are running for re-election in safely Republican districts. Cortes, who represents HD 30, and Olszewski, who holds HD 44, are both running for re-election in seats carried by Hillary Clinton two years ago, however, they both went uncontested in August and have substantial fundraising leads over their Democratic challengers. Those looking to attend the fundraiser can direct their RSVPs to Rick Porter via 407-849-1112 or Ivey Rooney via Ivey@PoliticalCapitalFlorida.com.